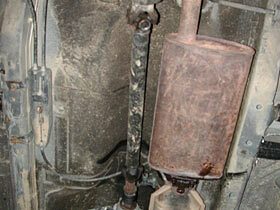 Our stock muffler had seen better days. Our ROCKBOX project Cherokee has been such a pleasure to drive. We picked it up with nearly 100,000 miles on it and paid well under market value for it. Since we got it a year and a half ago, we have done the basics, such as lift, tires, bumpers, rocker protection, roof rack, battery, winch, rear locker, radio, CB, etc. But what we have not touched yet was anything in the performance area, with the exception of a full bevy of tune-up parts. Since going up to 31 inch tires on the Cherokee sucked noticeable power from our automatic-equipped truck with 3.73 gears, we immediately noticed an expected drop in performance. Home is about 650 feet above sea level, which of course, is not high at all. However, we do have some very steep hills in our area with five and six degree grades that seem to go on forever - especially when we travel north. After lifting and adding the tires, we noticed our 4.0L engine knocking a lot and it seemed to struggle getting up these hills. The Jeep also seemed sluggish off the line, even for a truck with its mileage. Two of the easiest things you can add to your rig to gain a few horses under the hood are a cold air intake and a performance exhaust system. Our Cherokee had neither of these, so we decided to look into adding a new exhaust to see what sort of gains we could get. There are plenty of exhaust systems on the market to choose from but one of our requirements was that we not only wanted a performance gain, but we wanted a fuller exhaust note. But with that better sound, we did not want it to sound buzzy or extremely loud. We don't need our neighbors to be able to hear us coming and going and we didn't want to have to wear earplugs on long trips. We just wanted a nicer tone. The system would also have to be a bolt-on affair that we could do at home. 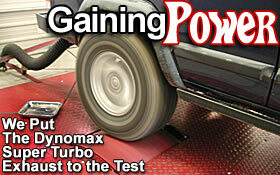 We contacted the folks at Dynomax, who make two different systems for the Cherokee - the Ultra Flow and the Super Turbo. The Ultra Flow is a straight-through design at the muffler, whereas the Super Turbo routes the exhaust through an S-shape. We discussed our needs and requirements and they suggested the Super Turbo kit, as the Ultra Flow would be a louder setup. 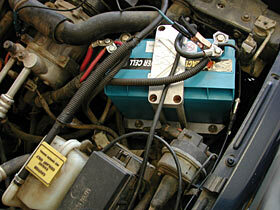 The Dynomax Super Turbo system. The whole exhaust is aluminized for long life. 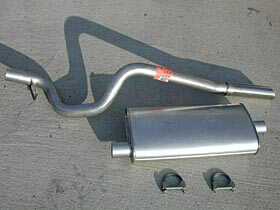 The Super Turbo kit is based on the #17747 muffler with 2 1/4" inlet and 2 1/4" outlet. 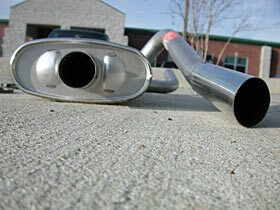 Mandrel bent pipes then route through stock positions to a 2 1/2" exhaust tip. The kit also includes two muffler clamps. The kit is all-aluminized for great looks and long life - unlike our ugly, rusted-out original one from the factory. Right after the Dynomax showed up, we decided that instead of just doing the review on a seat-of-pants feeling, we wanted to back up our opinions with some cold, hard data. Just in time, we heard that a new dynamometer shop had opened up nearby. We called over to Walker Dynotune and asked about using their new Dynojet setup for our tests. They were very enthused and we lined up a time to come over. We headed over in the late afternoon on about a 65 degree clear day. The plan was to do three baseline "pulls" on the dyno and take what we felt was the best one. We would then pull the Jeep out of the bay and take it next door to the oil change shop, go underneath in the bay, swap the exhaust out, and get back into the dyno shop for another three pulls. So into the shop we pulled the Jeep. 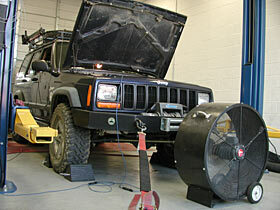 Walker Dynotune has an in-ground dyno setup, unlike other shops that sit above ground and take up much more space. 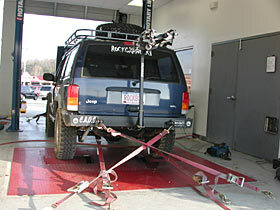 A Dynojet Model 248 Chassis Dyno is used for measurements, and we parked with our rear wheels over the dyno drums and then the Jeep was strapped into position. The guys at the shop couldn't have been happier with our setup, because both our front and rear bumpers have D-rings. Each one was strapped to the ground for safety then two more straps went around the rear axle. Up front, two more straps were attached to D-rings. All the straps were then cinched down, ensuring that in the case of disaster, the Jeep would remain in place and not go flying out the door of the shop. The front was secured and a fan was turned on. Four straps keep the Jeep from taking off. Once secured, a sensor was inserted into the tailpipe to measure the air/fuel mixture at the exit and then a hose was inserted over the pipe to route the exhaust outside of the shop. Another sensor was hooked up under the hood for additional timing measurements. Lastly, a large fan was placed in front of the open hood to help simulate cooler air being pulled in through the grille. 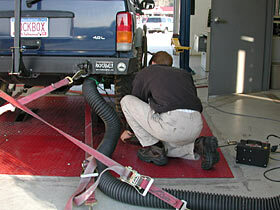 A hose routes the exhaust gases out of the shop. Sensors and wires hooked up under-hood.